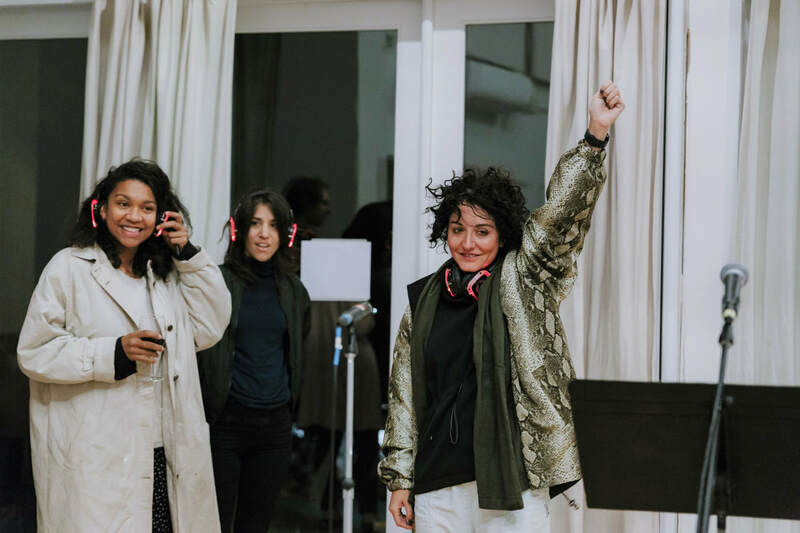 During any given week of the year, a diverse group of international artists are actively at work in their studios at Montalvo's Lucas Artists Residency Program. In our "This Week in My Studio" series, we ask them to share a snapshot of their experience. While at Montalvo, I was at work developing the next experience I will present to the public in 2020. While political theorist Hannah Arendt used to lay on her sofa to think in silence, painting is for me the best way to materialize and conceptualize thinking. So I’ve been painting ... a lot ... and thinking a lot. One of my favorite painters--Luc Tuymans--said that "while we might not remember the scene of a painting, we remember its tone and texture." And that is why he never works with glossy colors which come directly out of the tube--he develops a palette for each of the scenes he depicts in his work. Read more about Nelly's work here. Change is the only constant thing. The change of scenery can reflect how we feel. All the feelings of a new place always come with being more aware of our surroundings and environment. I like to be mindful when I am in a new place and around new people. The walks in Saratoga filled with ancient trees whispering in the wind. That morning walk gazing at the light coming through the trees. Repetition in nature is something I like to be conscious of. Looking at the golden ratio in nature is always fascinating and brings even more clarity. This time my focus is on the shape of circles and rings, rings and spheres. One that I have been avoiding for some time. But I am liking curves more than lines with edges, these days. The continuous lines of a circle have no ending. Tree trunks, for instance, and the circles that count the age of a tree. These circles seem to be stretching themselves all around us. ​Having my first introductory visit to the SETI Artist in Residence program. and being in the SETI Institute, I had the chance to meet many accomplished and well-known scientists, including Mark Showalter, with whom I am working closely on this program. After a few interesting meetings with Mark, talking about Saturn rings and other planetarium rings expanding in space, we found out that we are both big fans of rings. Charles Lindsay had the right intuition when he introduced me to the SETI AIR program, and the idea of science and art as a natural next step. My stay at Montalvo was short but one that will be followed with a longer stay. Read more about Zeinab's work here. Zeinab was in residence at the Lucas Artists Program through a partnership between the LAP and the SETI Artists in Residence Program. With the intention to forward the work on my Gumbo Family project, I am grateful for the decades that consumed my consciousness while working in my studio, moving this project at least a chapter forward. Only in a congenial and supportive environment like Montalvo could this happen with such clarity. What completely caught me by surprise was the connection revealed between science and art. In working through a portfolio project consisting of my archival photographic prints from the late 1970s (that will last 200 to 300 years or more), how do I place sound technology into the same portfolio in a way that can last as long? The solution appeared at artist dinner one evening when the SETI Institute, Artist in Residence Program (scientists and astronomers included!) joined us for dinner. Simply put, my mind was BLOWN! Expanded in thought and ideas…an intergalactic experience. Only at Montalvo. Read more about Jeanne's work here. 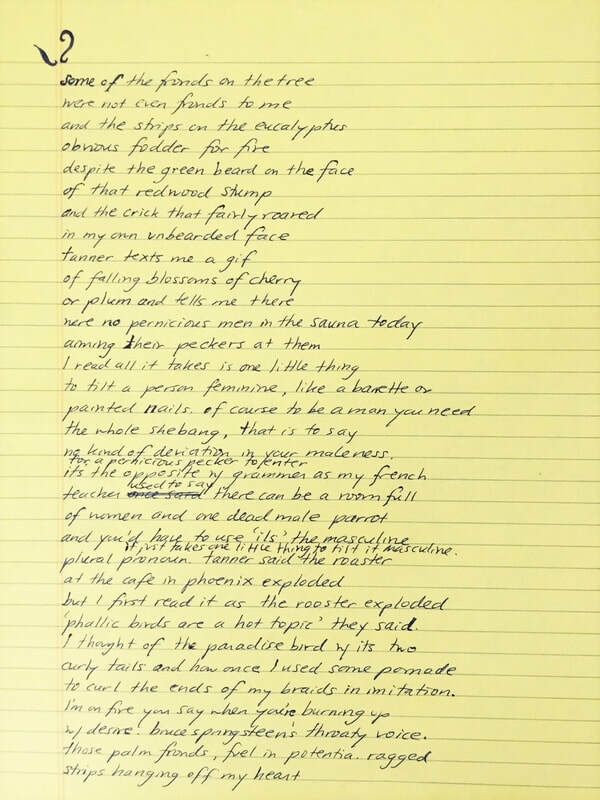 Among the "hordes" that you might find me winnowing (if you’d peeked through the window of my studio up the hill) were notes and pages from a historical/investigative poem about the history of New York (my current home), which I first started many years ago, abandoned, and have now taken up again. To have the extraordinary gift of uninterrupted time and space to give close attention to a project such as this was invaluable, but no less helpful was the opportunity to "winnow away" on other shorter poems, ruminate, cross-out, revise, re-insert, (or, indeed, to just quietly and unashamedly add to the mess!). It was so great to return for the third time to the Lucas Artists Residency. I developed a new series of works from materials found in local hardware and opportunity shops around the area, all new materials to me. These small works will become incorporated into larger works back in the studio in New Zealand. Conversations and connections with other artists, making, looking at and thinking about art every day—amazing !!! Destruction is a part of creation. Artists must be able to experiment in the studio and make “failures” without anyone else seeing them. Experimentation is necessary to discover new ideas and techniques, and failure is crucial to understand what does not work. Therefore, I embrace failure as a fundamental part of growth. My attitude is that all the work I do is an experiment. The days when I return to the studio to discover that what I had worked on the day before resulted in an exciting discovery, are exhilarating days. Conversely, the days when I realize I had merely created another failure are important to learn from, and are then followed by liberating moments of destruction. Read more about Monica's work here. carefully penned and now I'm experimenting with putting messier or at least more real-looking poems up there, these are the poems as they were written not the 'fair copies.' So they are like sketches, and they sometimes include my doodles. 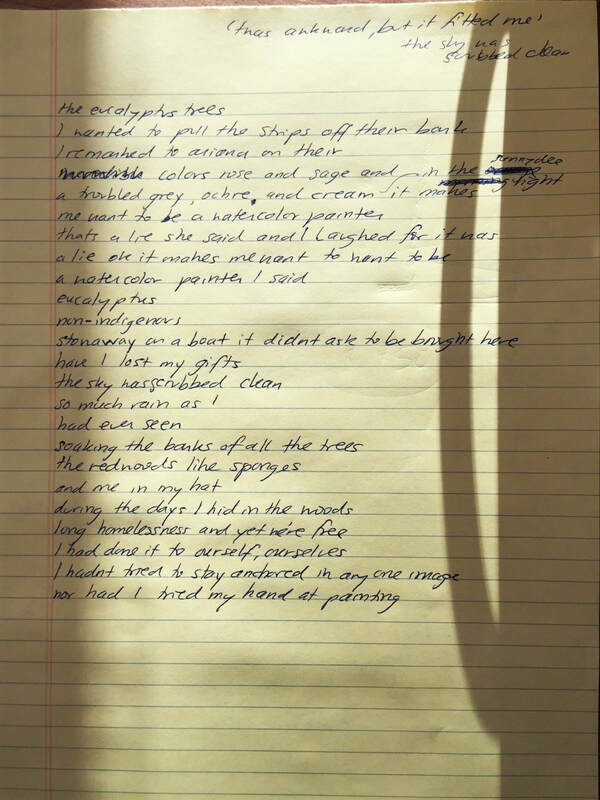 And I love the look of the blue ink on yellow legal paper. I've always written my poems this way and enjoyed them as written objects, but when they would become published they'd be denuded of some of this magic. So somehow posting these poems is letting me become a visual artist. ​Read more about Julian's work here. 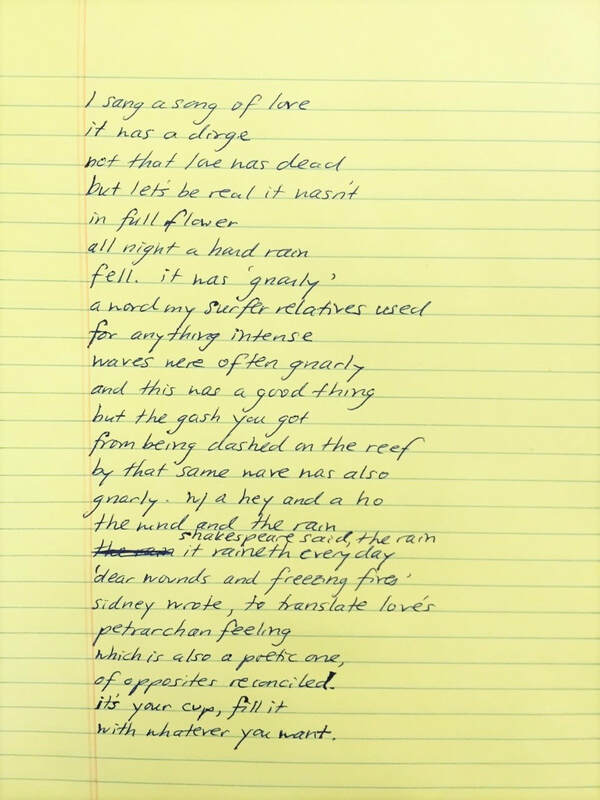 Click on the images to the left to read his latest poems "Valentimes." This week at the studio, I spent my time producing and reflecting on a new body of work. My main medium had always been drawing on paper, incorporating sculpture, photography, printmaking techniques, and clay on paper. Clay always informed my large-scale drawings and recently I leaped further into experimental mode, creating sculptures. I find the shift from two-dimensional work to three-dimensional exciting. Yet I haven’t had the time to write about this new way of working, shifting between mediums. The time at Montalvo allowed me to reflect and write about my process, and put into words an otherwise intuitive process of making. Read more about Dana's work here. This week in my studio, I am working on a newly commissioned composition for the Areon Flute ensemble. Arboreous Incantation (a working title) is inspired by my recent study of trees and plants. Because I am exploring unusual musical techniques, my time is being spent refining new scoring notations. Read more about Jane's work here. ​This week in my studio: I am vacillating between the silence of being alone with my work, listening to news podcasts, and having bad television play in the background as I sort through my grandmother's notes and make the last several images of "Collections From Sundown," a body of work about her relationship with Alzheimer's disease. I am also drinking plenty of caffeine and reading books in order to prepare for a new body of work I will begin this coming summer. Read more about Kija's work here. This week in my studio, I wrote about the way we manage refugees by not managing them. Focusing on an unusual protest that took place in Cairo in 2005, I examined a moment in which refugees and asylum seekers built their own impromptu camp directly in front of the United Nations High Commissioner for Refugees' offices (UNHCR), so that they might be acknowledged as "persons of concern" to the international community. This protest by way of architecture was ultimately unsuccessful: at least 28 people were killed when the UN informed the Egyptian government it could not reach an agreement with the protesters and riot police swept into the camp. But after this catastrophe, the international community began to develop new euphemisms for protection—that is, ways of talking about "protection" that would include such people. I am tracing the euphemisms we offer the dispossessed in lieu of much else. Many things have happened since my arrival at Montalvo. Two collaborators have flown in from my home town in Northern Japan and one collaborator from Los Angeles. The first week ,I was mostly preparing for the arrival of my collaborators. Although I knew my collaborators, I had never worked with them before nor met one of them. I studied the information gathered by using a Q&A from my collaborators in previous months, organizing the ideas of possible experimentations and collaborative projects. I spent a lot of time studying the oldest Japanese poem collection called “Manyo-Shyu” as I was inspired by the texts for the vocal works. I was also planning the possible concert program for RADIOEE's live broadcast from my studio, happening November 16. Since I didn’t know what my collaborators and I were capable of doing together until their arrival, it was challenging. But I set up my studio based on the information I had and I hoped for the best. Upon the arrival of my collaborators from Japan, Keiko Takayama and Keisuke Kodaira, we jumped into the work immediately, as we only had a total of eight working days. My method of collaboration is to get to know my collaborator as a person and as an artist first. As a composer, I am interested in finding our common threads of interests, surprises, beauty, strength, and music, which is only made possible by the unique bond I find during these processes. This project was a particularly challenging one as I had to face my past and home town, something that I left 23 years ago. It was completely mind-blowing--an experience I could not have anticipated. Our musicality felt so far apart, yet we connected immediately on a deeper level. Music that was so familiar yet so foreign emerged from our collaborations. We were all walking a fine line between comfort and discomfort. 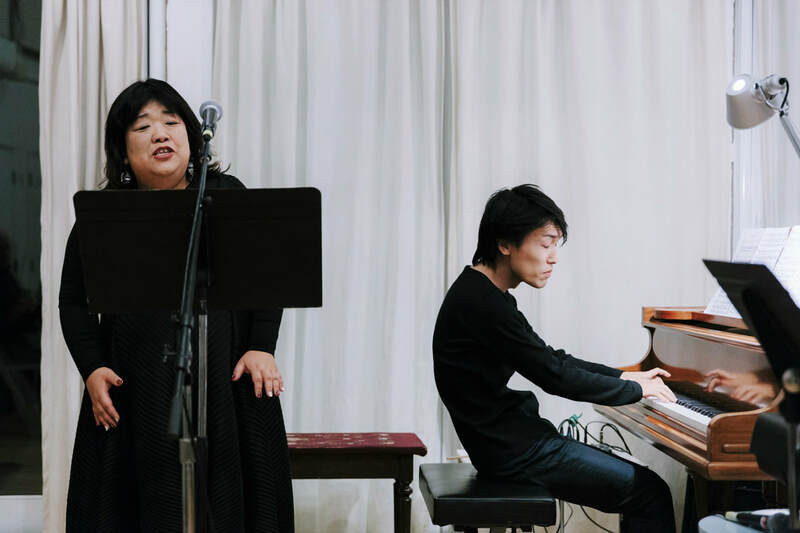 We were able to present some experimental works of a deconstructed Debussy piece, Japanese storytelling with soundscapes, and two piano compositions for the RadioEE broadcast. I also began writing two new compositional works specifically designed for my Japanese collaborators. 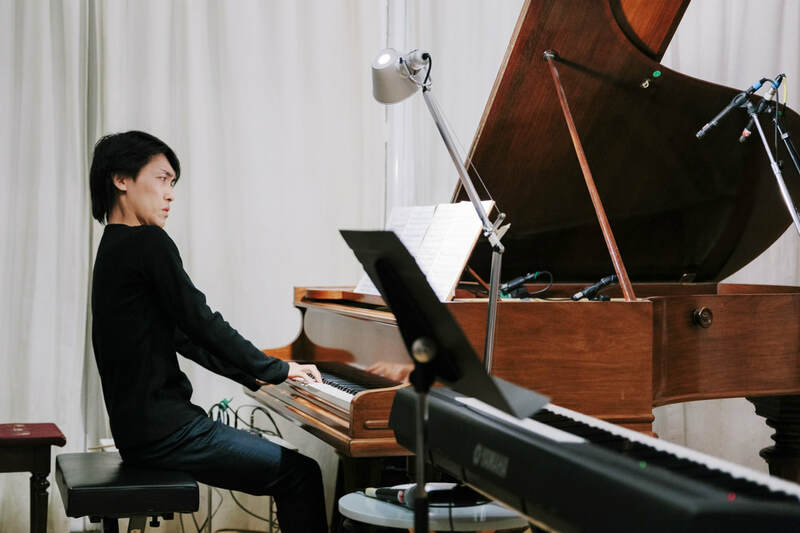 I will continue to work on these compositions and we will most likely perform in a concert in Japan, and hopefully in the U.S. in the near future. 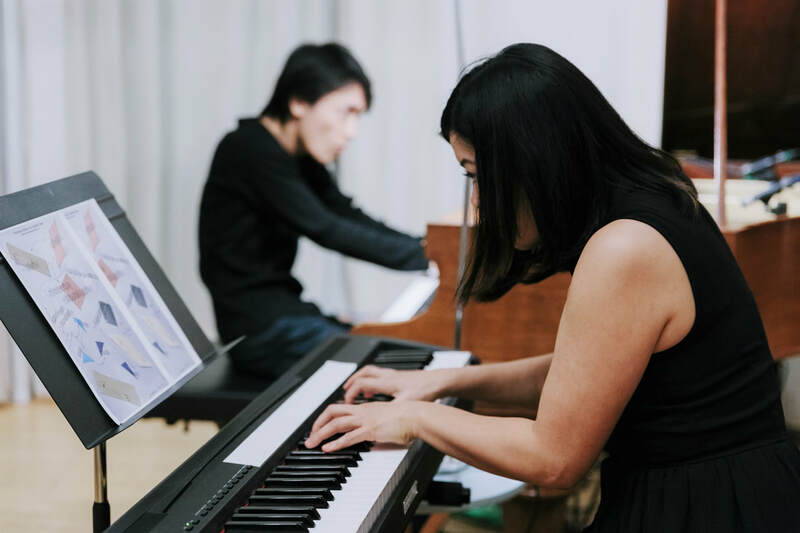 The third collaborator, Kozue Matsumoto, arrived shortly before the two others left, and we were able to get together to talk and have a jam session. Kozue is a Koto (Japanese Zither) player, and funny enough, none of us knew much about Japanese traditional music. Even the two from Japan were fascinated. After the two had left, Kozue and I had about a week to work on music together. She is also from Northern Japan and left her home town at a young age. We discovered that our experience in Japan and the story of leaving our home towns were strikingly similar. It was a beautiful moment, that we both knew how it felt, leaving our homes, and building our lives in the U.S. through music. Our collaborations were easy and smooth, but filled with so many discoveries. We discovered how different yet similar our instruments are and how beautifully their sounds blend together. I was also able to study Japanese Traditional Koto notations and techniques from Kozue, expanding my knowledge about world music, feeling the full cycle of my world music education, finally arriving back to my roots. Sometimes it takes a long time to arrive at home. Now, they all have left, and new artists are arriving from all over the world. My mind begins to wander to other parts of the world. I’m mostly reading poems from the Middle East, a part of the world I don’t know much about, while preparing for my upcoming concerts. Read more about Motoko's work here. Listen to Motoko's performance for the RADIOEE.net broadcast AUTOPILOTO here. Every time I come to Lucas Artists Residency Program something magic happens. On this visit I worked with my partner Zeyn Joukhadar on the creation of a large map of the night sky. Our idea was to construct an immersive experience where viewers could get lost following the lines of constellations and exploring the names of stars. Drawing on Islamic astronomy, we were especially interested in delving into, and uncovering, the old Arabic names of stars and shapes of constellations. I started my work using the rich research materials that Zeyn Joukhadar had generated for their novel The Map of Salt and Stars as my guide, slowly adding yet more sources. Star by star, this process was like exploring an incredible cosmic archaeological site (the largest ever!). Excavating layers of sediment piled up over time, we traveled down into the layers of overlapping meanings associated with groups of stars. We began to see traces of larger and more complex constellations that today are only partially readable or lost. Hints of different ways to look at the sky. Zeyn and I began to draft the map, trying to use and show all the information we had collected during this research process. We presented this sky map during an open studio/event called "The Dark Night of the Soul" (and we created a light sign depicting these words, which we installed ironically half-way up the hill along the path to our studio). Often used to describe a spiritual or existential crisis, this text also refers to the narrative plot point when everything seems to fall apart just before the hero's final resurrection. We invited other fellows at the Lucas Artists Program to also present their work, especially as it related to the theme of the event. This week I continued to revise my second novel, the story of a fictional Syrian American bird artist who rises to fame in the 1930s only to disappear at the height of her career, and the contemporary descendant of her childhood best friend in Syria who sets out to find out what happened to her. In addition to my work on my novel, my partner Matteo Rubbi and I put on an open studio entitled “The Dark Night of the Soul.” The focus of our open studio was the night sky, for which we created a floor-to-ceiling star map populated mostly by pre-Islamic Bedouin constellations labeled in Arabic. This work stems from months of research that I began when I was writing my debut novel, The Map of Salt and Stars (Touchstone/Simon & Schuster, 2018); Matteo and I have continued to explore this research together at Montalvo. We hope to continue this collaborative project in a larger, fuller form in the future. Read more about Zeyn's work here. Read more about Alva's work here. This week in our studio, our team is prototyping, animating, writing, choreographing, teasing those of us who make bad coffee, eating animal crackers by the fistful and forging through the jagged boundary between artistry and math. The end result has been well worth it: the first sparks of life have appeared within the world of DATAPRINT. Our next month as LAP artists will be focused on digital installations, choreography, and teaching David how to work a French press. DATAPRINT invites a conversation on digital autonomy by acquiring the virtual fingerprints of its audience through a succinct, interactive adventure, and then cultivating a world of dynamic, sentient data. Visitors to the exhibit compose an avatar simply by observing their own virtual habits, generating a digital incarnation that is then released into an ever-evolving ecosystem of social networks, surveillance, economics, and analytics. This week in my studio (my LAST week at Montalvo) has been very similar to the previous few weeks here this August. I've set goals and checklists for myself both musical and personal. I've tried to just get into it and keep moving while not putting up any barriers in the creative process. Personally, it's a goal to run up to the summit of Montalvo's hiking trails daily. It's also a goal to meditate daily. Over the last couple weeks, I've been using the Sonic Meditations of the great musical thinker Pauline Oliveros. I also have a short daily Ashtanga yoga routine which has unfortunately often fallen by the wayside. . .
​To view the full text, click here. Read more about Alex's work here. This week in my studio, I shifted the focus from my audio reactive performance practice to composing music for my one-man electro-acoustic project, Scrambler. Every morning I would sit outside in the sun with my classical guitar, drink coffee, and compose from scratch. After collecting sometimes fragments, and other times fully realized frameworks, I would then immediately head into the studio and track what I had written. First I would lay down the foundation on my guitar. After choosing the most fitting take and editing it appropriately, I would then layer in drums, electric bass, and sometimes an analog monophonic synth. My goal each day was to finish a draft by dinner time and then have a listen afterward and make adjustments, edits, and overdubs into the night. I would mutate each track by either processing it, converting the audio into MIDI, or utilizing an assortment of outboard effects such analog delay, chorus, fuzz, and cassette tape saturation. I am so thrilled to be here at Montalvo as a Lucas Artists Fellow to workshop these new ideas. Having no other distractions other than a sea of crickets and an occasional coyote or bobcat call is quite a blessing. Read more about Mike's work here. This week in my studio it was hot so I covered the windows and turned the fan on high and took off all the clothes of my words so they would get to the point which is the point of most of the rally songs my collaborator composer Byron Au Yong and I are writing for our Activist Songbook, a collection of 53 songs to counteract hate, but then Byron who is usually asking me to pare down my abundant and un-naked lyrics actually asked for a rewrite that was a bit less pared-down and more poetic, because the We The People rally song we were writing felt so bare already it maybe called for a little metaphor to lift it so I returned to something I'd written in the cool of morning staring out the window at the wild tangle of moss-and-lichen-lined trees and paired that with the disorderliness we're hoping we the people can aspire to (an imperfect union), and we made a rally song/rap that we taught and performed that very night as part of Montalvo's We The People event in between spoken audience-sourced ideas for a new global constitution and then I could breathe again and sleep deep in my studio. How do you make sounds fly around you by just flicking your wrist? My project for our We the People festival involved a piece I was performing for about a year now, which I wanted to adapt to Montalvo's landscape. The piece is not performed in front of an audience, instead the sounds come from various locations surrounding the audience. This is in a long tradition from at least the late 1500s, in which composers have split up choirs to have them perform in different locations in churches, or even farther apart, as across the Piazza San Marco in Venetia. This practice was picked up again in electronic music in the 1950s, in that multiple speakers are placed around the room. I have been working with multichannel sound for about 15 years now. To adapt the piece to Montalvo's landscape, we placed four speakers around Charmaine's Garden Terrace. For making sounds move through space, I am currently working with a so-called electromyogram sensor, which is a fancy name for a device that tracks electric activity of muscles. It's just a small arm-band around my forearm, sending data streams from eight muscles wirelessly to my computer. This week, I was working on refining my software's response to the sensor, and trying to get a better sense what happens when I flick my wrist, or twist my arm in certain ways. This week in my studio, I created a sound composition for Fujiko Nakaya’s fog sculpture at Overlook Shelter Ruins at Franklin Park, Boston. I experimented with reverberant saxophone sounds that I played and recorded in the TANK, a decommissioned 60 foot high water tank in Colorado. This August, my sound piece plays via a quadraphonic audio system, as fog emerges in the Overlook Shelter Ruins at sunset. Long time collaborator Sandy Perez also came to visit Montalvo and we played a saxophone/electronics and percussion concert for center’s exhibition/event, We The People. This residency at Montalvo is a gift. It’s a space for deep thinking and engaging with a dynamic group of individuals, as we co-produce Future IDs at Alcatraz. The year-long exhibition, opening this October, will feature ID-inspired artwork by men and women with conviction histories. With their support, I’m designing the exhibition, hosting meetings, and co-facilitating art-making workshops in the studio here at Montalvo and around the Bay Area. In stark contrast to prison-issued IDs, these artworks are about individual stories of transformation and how those stories collectively can help reframe the narrative of re-entry. The evening I arrived at Montalvo I was greeted by the staff and offered a tour of the facility; it was late and starry skies bathed the evening. Lori, the manager of the artist residency program, drove me to the top of the hill to Montalvo's historic villa. We walked through the courtyard and corridors; we went to the former library and out onto the balcony; we peered into a glass room that I imagine was a former greenhouse, and where Lori mentioned that a artist Margaret Kemp had staged a beautiful performance not too long ago. Finally, on the ground floor, Lori opened the villa doors to a magnificent lawn and garden where green grass looked silver under the moonlight. Oh Lord, I loved Montalvo at first sight. Lori invited me to walk in the garden. We meandered down a set of stairs into a large expansive green plaza where in the distance tall cypress trees cut elegant silhouettes into the sky. But my breath stopped when we passed a magnolia tree on our way to a pond and fountain and I saw the area that I would soon be using for a future garden that I would plant at Montalvo. There waiting for me were the magnificent Campanas of my youth, Angel and Devil's Bells with pink and yellow flesh, looking pale yet dangerous and irresistible. I have not seen them in such abundance since I was 12 or 14. I was transported back to La Vega Manguito, Matanzas but here I was in the north pacific hills of California, finding home again!!!! ​During Magda's stay at the LAP, she dipped beautiful dahlias and brugmansias in rabbit glue to preserve the flowers to later be used in her paintings. Click on the video shot by Valerie Wainwright to see the process. ​Read more about Magda here. ​Read more about Nina's work here. Work work work this week in my studio. Read more about Mrugen's work here. In the second week of my residency, I began a shift from what had been my original focus to the project that turned out to be the primary work of my time at Montalvo. The walls of my studio encouraged me to spread out my thoughts about both projects and I quickly realized the play I thought I was writing—a metatheatrical, audience-participation town debate for the 2020 mayoral election in my fictional North Carolina town of Hawboro—needed workshops and research I could only do in North Carolina. So, I shifted to attempting to write in a form I know as a director but have never written in—American realism. Again set in Hawboro while riffing on “Edward II” by Marlowe, my play “Edward, Too” is the kind of American realistic well-made play Hellman or Inge might have written if they had the freedom to address forbidden topics. The open studio day allowed me to share both projects and my process. Allowing strangers into an early writing process can seem intimidating at first, but it showed me new ways to collaborate and share. Conversations with visitors suggested new ideas and directions for both projects. Last week I was preparing for the final iteration of Vital Signs, the series of performances I curated over the 2017/18 academic year at Stanford University. Here I hosted Keijaun Thomas and Ron Athey and facilitated their performances and a public dialogue. I also continued to teach my class, Social Sculpture, at Stanford University and work towards a new collaborative piece with the students called Sweat Paintings (a reinterpretation of Yves Kleine). That week, I also hosted Ron Athey and Arshia Fatima Haq up at Montalvo. There we engaged in lengthy dialogue and research in preparation for our upcoming collaboration at the Museum of Contemporary Art in Tucson, opening December 1, 2018. Additionally, I spent my time redesigning my website and creating a complete back-up of my archive of work. Read more about Cassils work here. This week was hopping with staff and residents getting ready for the annual Open Studios event. Besides discussing with the other fellows what to present, another artist and I exchanged studio visits to learn more about each other’s work. While hiking on Montalvo’s trails, I saw the wooden signs for A Healing Walk by Susan O’Malley being re-installed. I worked with more intricate patterns for my blackwork sampler and split my time between a video triptych and a screenplay on my mother. For the triptych, I shared an audio file of me singing (badly) "Solidarity Forever," with my sound designer in Lisbon and finished stitching a test figure for one of the handmade video screens. After deciding to revise the screenplay, probably subconsciously in anticipation of Mother’s Day, I restructured much of it and gained some clarity on how to tell my mother’s story, with a movie goal and theme. Watch short clips of some of Tran's films here. This week in my studio: writing a song book of 10 pieces for saxophone and piano. Inspired by the musical genres of my hometown (Santiago de Cuba) such as tumba francesa, conga oriental, son, etc., the compositions have been created using multiple devices: from the piano, from the saxophone, by design, abstraction and forming patterns. Read more about Roman's work here. This week, percussionist Ben Reimer and I researched sound combinations in preparation for our March 22 concert at the LAP with San Francisco-based duo, The Living Earth Show. The set list included previous work but I wanted the instrumentation choices to reflect our surroundings. This meant merging portable electronic devices--many of which were analogue and archaic--with the even more analogue and archaic: flower pots, shovels, industrial fans, dirt, leaves, and an enormous cricket that lived with me for seven nights (but who I had to kick out before the concert due to relentless, ear-piercing chirping from 1am-7am). Integrating sonic and visual technology that I work with every day within these new surroundings was exciting and something I will delve into further. ​Read more about Nicole's work here. This week I’m focused on constructing new forms of mystery. I’ve been see-sawing between drafting the tricky middle regions of a neo-noir manuscript, and picking apart how others architect mystery in their own noir-ish novels. In heavy rotation right now: Jean Echenoz’s Big Blondes, Laura van den Berg’s forthcoming The Third Hotel, Kem Nunn’s Tapping the Source, and Alissa Nutting’s great Made for Love. Each book takes a piece of well-worn modernity or pop culture (reality TV, film, surfing, big tech utopianism) and exploits its darkest under folds, using narrative strategies and characters that always manage show us, us—but in an intriguing way that poses far more questions than answers. At Montalvo I’m writing towards those unanswerable questions and learning more each day about the characters posing them. ​You can purchase his book, The Brand New Catastrophe, here. This week I'm enjoying interacting and fellowshipping with the other artists in residence here on the LAP hill. We have much to learn from one another in these dark days. I'm also revising a new play that is a work-in-progress about America's history of political violence. It's a comedy. Hadi Tabbal acted in a reading of my play She He Me a few years ago in New York City. We recently decided to collaborate on the play. We are so grateful to Montalvo for giving us the time and space to begin our work. ​Read more about Will's work here. ​As part of my performances, I use simple objects that relate to my daily life. I am interested in repetitive actions and I intend to focus on everyday activities, clearing the land with tools that my ancestors used from the past to present and future. Helepelu (machete) has a subtleness to its appearance but it is not to be underestimated--it can be destructive. I take the movements from using this tool as the inspiration for making marks for my paintings while I'm at the Lucas Artists Residency. Reading Maria Sabina and pseudo-dionysus by the glow of the espiritu santo candle, making up a song about a horse in apache, writing poems by hand for my blog: https://julianspoems.tumblr.com/. This week in my studio, I’ve been trying to write about "pseudomorphosis." You know what it is, but I bet you didn’t know there was a name for it. When people forget to make any distinction between ornithology and the birds: that’s pseudomorphosis. (I stole that example from the artist Barnett Newman). The reason it matters, and the reason why I’m banging my head against this problem, is that the question of pseudomorphosis also exists at the heart of humanitarian governance. At Montalvo, I’m trying to write about the way that an entire humanitarian order represents its own way of looking at categories of humans--refugees, for example--as if those categories constituted the dispossessed themselves. I’m writing a critical account of the way that a kind of humanitarian un-reason substitutes itself for its object. It is only by spending time here among remarkable artists who are now my friends that I’ve come to understand that this project is all about an aesthetic substitution, whereby a political project presents itself if as if it were anything but political. This week in our studios, we are working on our duo project, “Boroboros.” We named the project after a roughened adaptation of “Ouroboros,” an ancient symbol depicting a serpent chasing or eating its own tail. The Ouroboros is a symbol for the integration and assimilation of the opposite. In the sense of something constantly re-creating itself, the collaborative project “Boroboros” is a 'feed-back' process between visual and sound, organic and mechanic, microcosms found within the macrocosm. Interactive possibilities will be explored in which sound could eclipse the visual and visuals could emit sound. The final product will be an album allowing listeners to re-experience this immersive call and response. Listen to the initial sounds from “Boroboros" on Soundcloud. ​Read more about Yasuhiro's work here​ and Kio's work here. This week in my studio I am revisiting old friends and places through the materials I am working with. As a continuation of my “Phase” series, works of speculatively altered animals that need to adapt radically to survive in their changing environments or face extinction, I am working on an aquatic polar bear. The full-sized bear is needle-felted with wool that I have gathered while on residencies in Iceland, South Africa and the Northeast. The properties of the wool vary greatly depending on the type of sheep it was sheered from. The Icelandic wool is heavily barbed and felts quickly. The majority of the body structure is constructed with Icelandic wool. The New England wool is used for refining the muscular form and adaptive details of the polar bear. The South African wool dyes beautifully and is used for the topcoat of colors inspired by glacial ice. ​Read more about Karrie's work here. What a blessing it is to have the space and support to dream and manifest. This last week has been a beautiful dive into expression and humanity at Montalvo. I have been blessed to be a part of such rich conversations. For many, the ideas and beliefs that surface around identity are complex and tender at best. As artists, we get to rub up against the tender spaces, grace and creativity leaving room for growth and transformation. Artists offer new ideas when the old ones aren't working so well. Now, more than any other time in my life, we need those new ideas. My overall project is a creation myth called Ayo and the Aquarian Mind that will be performed as a theater concert with visuals and prose. The piece is about the nuances of love, agency, interdependence and purpose. This Friday, December 15th, I will present music and poetry from the piece in the Carriage House Theatre at Montalvo. Join us! ​Read more about Jennifer's work here. ​Read more about Byon's work here. ​Read more about Andrea's work here. The first week in my studio, I had to direct via Skype the final recording and mixing in Vienna of a new song cycle, Rhapsody, which I hope to bring to the west coast next year. Rhapsody is the second part of my Terminals trilogy, exploring the experience of travel. Luckily I was here at Montalvo with internet and excellent speakers, which made this even possible. Now I am working on Part III, which at this early stage is to be scored for one baritone voice and a percussion quartet—so percussion to be exact—playing four analog synthesizers and four taiko drums. I like to have multiple projects going on simultaneously, so I set up a mobile recording studio here in Studio 21 and I am finishing recording and editing “Visitor,” which will be a series of six solo records on six unfamiliar instruments. “Visitor” is an attempt to find out what happens if an instrumentalist is separated from their instrument, and instead is tasked with making 60 minutes of music, played live, with instruments on which they have a very limited technique. I may even find an answer. Read more about Bobby Previte’s work here. ​Read more about Garett's work here. Last week, I put together many of the ideas collected during the my three-month residency at Montalvo, and visual artist Leonardo Chiappini and I collaborated to transform these ideas into artworks. The results, presented in an open studio, consisted of a light sign, a drawing, a light sculpture, a wood installation and a small bar to welcome people. The works were all inspired by the legendary Island of California as it is described in the 17th century book written by Ordonez de Montalvo--an inaccessible island with steep cliffs, inhabited by a community of black Muslim women. 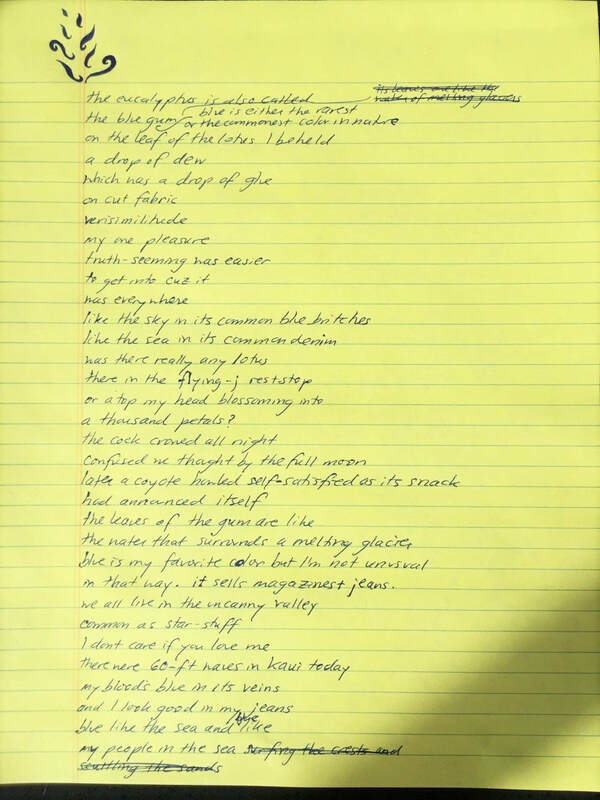 Together with these reflections, we presented a project by writer and LAP Fellow Zeynab Joukhadar, who built small golden paper astrolabes related to her novel “The Map of Salt and Stars,” gave a reading, and showed an original handwritten preview of one of the shape poems from her book. Read more about Matteo's work here. ​This week, I’m designing the opening section of Four Bridges, a sound installation commissioned by Montalvo, which visitors will be able to experience through their smartphone as they walk through Montalvo’s forest environment. This segment combines field recordings made onsite with recordings of non-indigenous sounds. My goal is to create a sonic journey that ushers listeners out of the everyday world into the mystery of the forest. ​Read more about Howard's work here. This week in my studio I am disentangling plot strands — oh so many of them, all running in different directions!—in the new historical novel I’ve come here to work on. There is also significant chopping, and the consignment of unwanted chunks to the basket of remnants, scraps and useless notions. (I sewed a lot in my teenage years and the process of revision has certain similarities!). Then in the early mornings I am free to start spinning again, while watching the spiders do the same in the bay trees outside my window. ​Read more about Alix’s work here. This past week was amazing…the great emotion of being surrounded by artists from around the world, remarkable cooking, grandmothers’ recipes, super special meals, and a lot of work in the studio. Together with my partner Ivan Buenader and my assistant in Mexico, this week I have been working on organizing the mounting, shipment and preparation of a large installation project in Richmond, Virginia; putting the finishing touches on a book documenting the 12 years of the Changarrito project that is now being printed; preparing for an event and talk on December 4 at the Amparo Art Museum in Puebla, Mexico; and mounting some of the recovered paintings in the Project Space at Montalvo, as a preview of "The Collector," a future installation I am proposing for the forests at Montalvo. In addition to all of this, this week I finished taking the photos for a stop-motion animation that I developed here in residence at Montalvo--more than a thousand photographs that will now be cleaned and incorporated with original music—perhaps by composer Magda Mayas, who was in residence with me at Montalvo this month. Meanwhile, Ivan is working on his new novel, creating new installations in the courtyard of the studio, and writing his reflections on the artistic process. Thank you, Montalvo! Love you! Read more about Máximo’s work here. This week in my studio, I am pulling apart the first draft of my second novel and continuing to write new scenes to create the second draft. Now that I’ve completed a revised plot map and character arc map for both timelines in my novel, it feels good to be drafting again and watching the second draft come together. One of the scenes I’m most excited to write this week is in the timeline that takes place in the 1940s, when a small enclave called Little Syria flourished in New York City. In this scene, one of the two main characters (a recent immigrant from Homs with her family) embarks on a journey across America to become the first Syrian American bird artist. It’s a lot of fun for me to think and write about bird art in these terms, too, since I’m also a visual artist—something I’ve had the immense gift of being able to explore and collaborate on here at Montalvo while working on my second novel. Read more about Jennifer’s work here. This week, before we leave Montalvo, Tony Buck and I are editing and mixing a new album of our duo, Spill! So far we have released three albums and this is going to be our first vinyl! It’s a mix of a four-channel recording together with live improvisations, piano, objects, drums, percussion, objects…It’s great to spend two weeks doing just that. ​Read more about Magda’s work here. This week in my studio, I am working on an extensive text that will be part of my fifth book of poetry in Arabic. The text revolves around the Mediterranean Sea, the Mediterranean that became a predator that eats the bodies of Syrians, the sea that has been turned into a mass grave for a people fleeing from that other predator, the Syrian dictator. Read about Ghayath’s first book of poetry to be translated into English, here. What am I doing this week? Well, I am trying to crack my head open. It’s a tough thing to do, but it’s surely much easier when you’re living among so many trees, and even more so when the skies are so clear, like they are here in Saratoga. There seems to be a direct correlation between clarity of sky and clarity of mind. Apart from that, all is well: my studio is upside down; the time difference has disconnected me from the outside world; I have 2 hours of recorded audio to transcribe (fun! ); lots of books to read, research to continue, words to write, and hours to scratch my head. I’m hoping that in the process, my head will actually crack open and I could begin writing the book I came here to write. I’ll surely end up on the dance floor in Los Gatos on Saturday if all goes according to plan. Meet me there! Read more about the magazine that Ibrahim founded, The Outpost: A Magazine of Possibilities, here.